I’m thrilled that Project Me has made a great list of 25 Must-Read Personal Development Blogs, especially given that I share the bill with one of my personal faves, Gretchen Rubin. Gretchen first came onto my radar several years ago with her book The Happiness Project. She’s as fascinated with happiness, human behaviour and habits as I am! I once spent five consecutive days sitting in a doctor’s waiting room, surreptitiously observing and writing down where people chose to sit and which magazines they shuffled through. The following week I did a similar same thing in a cafe. Before you assume I’m some kind of weirdo, It was for my sociology class at university. I especially love her Four Tendencies framework to help people understand how they tend to respond to expectations, both inner and external. As a productivity and goals coach for mothers, it’s useful for me to understand if the person I’m working with needs my accountability (ie: a kick up her backside to make sure she follows through! ), or if she’ll rebel against that and needs to do things her own way. Others respond better to lots of useful information. Once they have the facts, they make decisions they trust. Since we’re all different, self-understanding is the key to reaching our goals and mastering our habits. You can take Gretchen’s online quiz to find out which of her four motivation types you are. It’s fun and interesting to consider which category your family members fall into too. It’s helping me to understand and respect our differences. 1. Upholders respond readily to outer and inner expectations. They’ll do things because they ‘should’. My older son is an absolute Upholder. Having an Upholder child makes my life easy! He follows the rules, he’s class president, he does homework and keeps his room tidy without nagging because he has high expectations for himself and, because others expect things from him, he follows through on all commitments. My husband is also an Upholder which makes him super reliable. Looking at the flipside, he works too hard, he feels obligated to do things because he ‘should’ and because it’s the ‘right’ thing to do, rather than because he actually wants to. He also pushes himself too hard in sport and fitness, sometimes leading to injury. 2. Questioners question all expectations. They’ll meet an expectation only if it makes sense to them. Essentially, they turn all expectations into inner expectations. This is 100% me. I will happily do something if it makes sense to me. I don’t believe in doing something just because I ‘should’. I weigh things up, take facts into consideration (or pause and see what my inner wisdom is saying to me). I often visualise how I will feel if I’m doing it to see if it feels right to me. Unlike Rebels (see below), I’m not rebelling against what others are proposing to me, I simply want to make an educated decision. I can often be swayed into doing something if the reasons are presented to me compellingly enough. I’m naturally cooperative because I want to be, not because it’s expected of me. 3. Obligers meet outer expectations, but struggle to meet expectations they impose upon themselves. Surprise, surprise… The majority of the women in my goals coaching programmes who took the quiz came out as Obligers. They need outer accountability to stay on track. They also find it hard to say ‘no’ to others and end up with way too much on their plate because of it. But I’m helping them with all of that and I’m super proud of their progress! 4. Rebels resist all expectations, outer and inner alike. Anyway, I find it all fascinating, so when Gretchen launched a podcast a year ago, I immediately subscribed and it’s become my weekly good habit to listen to an episode. 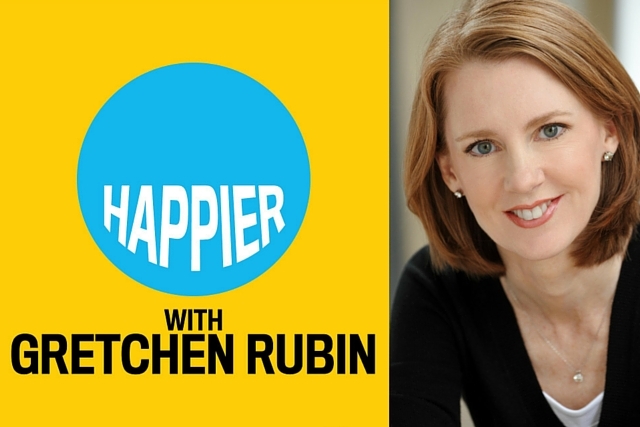 The Happier with Gretchen Rubin Podcast is a fun and chatty show that explores various topics that’ll help you understand yourself and others better. It can be accessed via her website, or you can subscribe and listen on your phone using a podcast app. I like to have it on the go so I can listen while driving, cooking, cleaning or at the gym. If you’re unfamiliar with podcasts, Gretchen has some easy instructions here. I recommend starting with Episode One for the introductions of Gretchen Rubin and her sister, Elizabeth Craft, who do the podcast together. Their contrast in personalities makes for a lot of interesting perspectives. After that, you can skip around according to the topic. It’s also good to listen to the newest episodes as they are seasonal and timely and you can participate in the comments or give them feedback on specific ideas they’re exploring with their listeners. I want to award a Happiness Gold Star to Gretchen Rubin for feeding my insatiable appetite for the study of human behaviour! Now it’s time to take action. Rather than consuming new information, then clicking away, take the Four Tendencies Quiz here. In the comments below, either report back on your tendency – or let me know what your top takeaway is from this post. Are you now more aware of the differences within your own family members? Can you see that your way isn’t the only way or the ‘right’ way? Can you be more accepting of these differences now? I’d love to hear your thoughts. I love Gretchen Rubin and took this quiz to confirm what I already knew. I’m an obliger. I find it hard to say no to others and I end up doing what other people want me to do more than what I would like to do. I would like to change this about myself. Thank you for this reminder and let me know if you have any advice. Saying no to others means saying yes to yourself. You have your own priorities and needs, just like everyone else. Saying ‘no’ is about respecting and valuing your time. Once you learn to decline requests that don’t meet your needs, you’ll find how easy it actually is. Say ‘no’ to distractions or anything that takes you away from how you want to be spending your time. You’ll create more space for yourself and things that are most important to you. This is very useful to know and I agree that the more we understand ourselves the better. I can see that I need outside accountability to follow through or to stay motivated. When I found a fitness buddy I finally got into a great regular fitness routine. But she’s moved away and I realise that I need to find someone else to workout with or maybe I need a personal trainer. I just can’t seem to stay on track on my own! What I love about Gretchen’s Four Tendencies framework is that you can see that there’s nothing wrong with you for needing outside accountability and it’s not something you have to try to force yourself to change. You are who you are, and now it’s about finding effective ways to work with that! You’ll find my Weekly Fitness Planner there too. What about scheduling in your workouts for the week ahead, then asking a friend or family member to hold you accountable? When my friend and I fell off the fitness wagon, we agreed to send a photo of our completed Fitness Planner to each other every Sunday evening. Then we checked in with each other the next week. It worked! Good luck to you Marianne – you can do this!! I first heard about Gretchen and her podcast through you! I think you posted a link on your Facebook page last year and I have been listening every week since then. I love it too! She and her sister make a great team. I can relate more to her sister actually! Elizabeth and her messy closets and aspirations to write a book, but never quite managing it. But she tries and I do too. Thanks for connecting me with so many great ideas and people and books and podcasts!